Over the last year or so I’ve become fascinated by the Tudors, particularly Henry VIII and his wives. This is something I knew next to nothing about until I started reading the Shardlake novels by C.J. Sansom, and that inspired me to start reading the history. Having read about Henry VIII, the next place to go seemed to be his heirs. 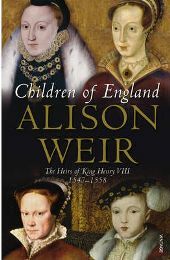 Children of England by Alison Weir covers the period immediately after Henry VIII’s death, when his son Edward became king at the age of 9, and then continues through his reign, the tragic and short reign of Jane Grey, that of Mary, daughter of Katherine of Aragon, until her death and the ascension of Elizabeth to the throne. The first thing I noticed about this book was how much shorter it was than the book by Weir on my bookcase, The Six Wives of Henry VII. But then Children of England covers a much shorter period, not much more than a decade. Weir’s writing is very readable. I chose her book about Henry VIII and his wives because it received favourable reviews and she seemed a respected writer. Having liked her style and attention to detail in that, I decided to stick with her for the next part of the story. She writes in a style that is reassuringly knowledgeable and confident of the facts, but which is very accessible. Her books are not dry, historical texts but they read like exciting novels. As they should – the stories found in history are exciting, and need no embellishment. On several occasions while reading Children of England I found myself on the edge of my seat, reading as fast as I could to find out what was going to happen next. Weir recounts the exciting events and tragedies of this period, but she also pays attention to detail. She discusses clothes, books, pastimes and relationships, so that the reader is given a full picture of life at the time, particularly life at court. This, along with her style, puts the reader right in the middle of action – it is easy to picture everything, imagine the sounds and smells. I always respect and believe the facts that Weir presents, however there are of course times when the facts simply aren’t there. Documents may have been destroyed or records never created in the first place – this was many centuries ago when such things were not necessarily thought of. On the occasions where Weir cannot give the reader a cast-iron fact, she gives what fact she can, and then presents the different possible conclusions that can be drawn to fill in the gaps. She will then state which seems most likely and why. I appreciate that she gives all sides of the argument and backs up her views. I feel this adds to her credibility, and more often than not I find I agree with her conclusions. It is hard to comment on the “story” of a book when it is history. The writer can tell it as best they can, but the story is fact, it cannot be changed so it is not easy to review. However it is possible to comment on whether this is an interesting period of history to read about. The heirs of Henry VIII really did not have a very good time of it, and we learn about how they are manipulated and all the machinations which go on behind the throne. It is a fascinating time to read about, particularly given all the various changes in fortune that the heirs go through. Personally, I enjoyed reading about Henry VIII’s wives more, but I still enjoyed this book. I actually found I read it very quickly, whereas usually I take my time with historical books. With the book ending at the ascension of Elizabeth, it left me wanting to know more. While I know a great deal about Mary, Queen of Scots and her relationship with Elizabeth, I have not read anything from the English side. Weir’s book Elizabeth The Queen will be next on my reading list after another two I have for further back in time (Lancaster and York and The Princes in the Tower). I thoroughly enjoy Alison Weir’s writing, and have come to regard her as the first port of call for books about the Tudors and this period of history. I intend to slowly work my way through all her work. I enjoyed Children of England and would recommend it to anyone interested in learning more about the aftermath of Henry VIII’s reign. No Comments on "Children of England: The Heirs of King Henry VIII"